Handling pharmaceutical tablets or other fragile food products continues to be plagued with ergonomic disadvantages. Many plants today are still manually lifting, scooping, and dumping cores and tablets while living with the inefficiencies and ergonomic issues inherent to these repetitive motions. The manual handling of fragile products is a common procedure due to issues associated with preventing product damage and dealing with other quality assurance. However, it is now possible to handle these fragile products in a completely automated and hands-free fashion using dense phase pneumatic conveying. We have years of experience when it comes to the automated handling of tablets or other fragile products. 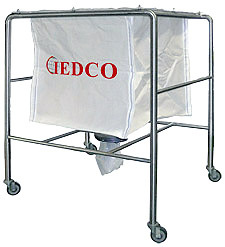 Whether it is to or from a tablet press, tablet coater, laser drill, or other tablet processing equipment, IEDCO has the knowledge and expertise to transport your tablets in a safe and reliable manner. 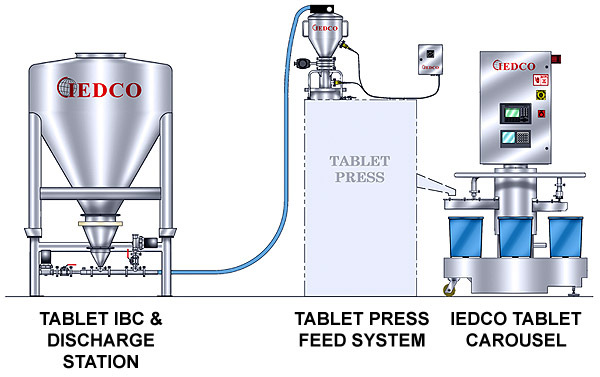 We have designed a system to handle tablets in a safe and economical fashion that uses an FIBC (or bulk bag) instead of a rigid IBC container. By using an FIBC as the holding vessel, we have eliminated the need to maneuver and house large, heavy IBCs. The system is designed for convenience by utilizing reusable and disposable FIBCs that are transported in a light and easily stored stainless steel frame. The FIBC uses a replaceable inner bag that is filled through a flexible opening in the top. This throwaway bag can be replaced as necessary without difficulty. The bottom of the frame is fit with an iris valve that can control the flow of the tablets in a safe and gentle manner. This system can be integrated with virtually any existing tablet handling process.